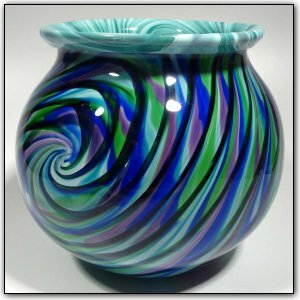 This round bowl was made from hand pulled cane featuring shades of blue, green, purple and aquamarine. First Dirwood hand pulled the canes used to make this bowl, then he made the bowl using those canes. The unique pattern on this bowl was created by using the complex "reverse axis" technique, creating a truly unique one-of-a-kind beautiful bowl.